Our original giant molecular models were intended for use in static displays, but we have since modified them and developed models that can be detached and reattached. These giant molecular model kits are suitable for a wide range of applications, from lecturers demonstrating chemical structure or shape in large lecture theatres, through to children's education centres to introduce them to the basics of how atoms fit together. How you use them is up to you. The balls incorporate stubs that the rods fit onto, just as with miniature model kits. Unlike most model kits, though, there are no pre-defined contents to any of our sets of balls and rods - you only have to buy what you need to use. You tell us what colour balls you want (we can match to any colour, including very specific colours), how many bonds and what bond geometry you want for each ball and we do the rest. Bond lengths are cut to suit your requirements. 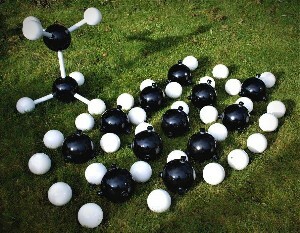 Balls with only single bonds are supplied as individual units; due to the way that they are constructed, balls with multiple bonds (C=C, C=N, C=O, etc.) are supplied only in pairs (or higher multiples in the case of, for example, allenes).